We couldn’t be happier with the selection of cakes provided by Homemade Bliss™. Our clients are always quick to ask where we got them from based purely on display alone. They are equally satisfied once they have taken their first bite and consequently we have clients return over and over again just to have these amazing treats. The diverse Gluten Free range has proven to be extremely successful and appreciated by so many of our clients. We highly recommend Homemade Bliss™ and it’s fantastic to see local businesses supporting each other. Cakes that taste as amazing as they look! So glad we found Homemade Bliss™. We have been sharing Homemade Bliss™ love in Maryborough for the last 2 years. Our customers love the wide range of Gluten Free cakes and slices. Lots of choice and quality products. If you are looking for quality, choice, professional service and beautiful cakes Homemade Bliss™ is for you! Homemade Bliss™ make Gluten Free look and taste amazing. Our customers love the range of sweets and we love that we can offer customers such a large range from Gluten Free, Dairy Free, Vegan or Paleo! The team at Homemade Bliss™ don’t just make great cakes, they’re also a great business to work with. We have been stocking Homemade Bliss™ for over a year now. Their products are very good and deliveries are always on time. Nowadays it is important to offer Gluten Free/Raw/Vegan options as people seem to be opting out of conventional products every week. At IGA Marketplace stores we love supporting local suppliers, we love good food and we pride ourselves on exceptional customer service. When we met Faith and the team from Homemade Bliss™, we knew it was going to be the start of a great relationship. Their products are amazing, service is fantastic and we just love that they are local. But perhaps best of all, our customers love their cakes, so we are expanding our range across all our stores. Homemade Bliss™ have been supplying our busy cafe for over 4 years now and the products they create are by far the best sellers in our cake range. We love their professional approach to providing high quality creative products that consistently meet the market. Thank you Faith. I would like to say a huge and truly heartfelt thank you for your amazing choice of cakes and the way you contributed to make my first day in business such a great success. Addictive Aprons & Cakes cannot thank you enough for your high standards in quality and professionalism. I look forward to many years of business with you. Thank you! Homemade Bliss™ made it possible for my Café to have a reputation for having the largest and most sensational range of Gluten Free cakes and slices. Homemade Bliss™ have the best Vegan selection available wholesale and I became well known for my Vegan, Paleo and Raw variety of cakes. People stand in front of the cabinet in awe and disbelief at the variety, at one stage I had 24 different selections of Homemade Bliss™. Glad you’re keeping up the good work Faith and thanks for always looking after me in such a professional and polite manner. Nothing is too much trouble and without you my business wouldn’t have the wow factor. I’m looking forward to being able to stock your Gluten Free range of slices and cakes in my new Gold Coast café. Homemade Bliss™ has provided Kimnat Little Market and Cafè with great tasting Gluten Free cakes and tarts since 2011. They complement our range perfectly to provide a wide range of options for our customers. 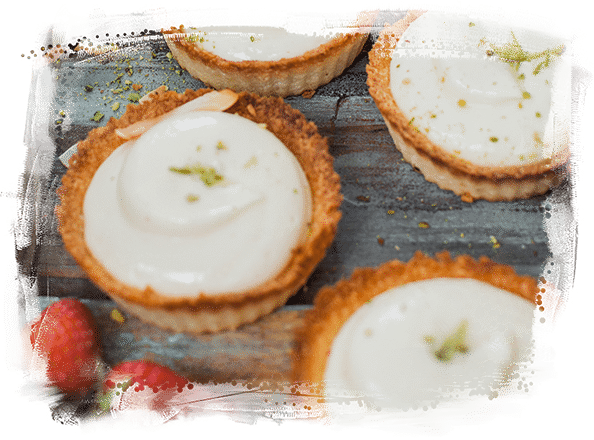 Homemade Bliss™ products have always been popular with our customers and we can confidently say they are among the best Gluten Free cakes we have come across. The diverse range of flavours helps us offer something for all tastes. Thank you, Faith, for always being so great to deal with and for delivering our orders on time and presented beautifully. Homemade Bliss™ is a great supplier for specialty cakes. We have been using them for quite some time now and have never had a problem with their products. They always take care while delivering to ensure no damage comes to their products. They have a large range, with beautifully decorated individual cakes, tarts and slices. We always have people admiring their desserts and they are one of our customers’ more preferred choices. I would recommend anyone to use Homemade Bliss™ as a supplier, their cakes look amazing, taste great and bring a fresh look and vibrant colour to any tired looking dessert cabinet.